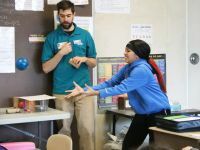 Kingsford Park Elementary students in Kelly Moxley’s fifth-grade classroom recently enjoyed making connections and a traditional Irish meal with some of their community pen pals. Because Sharon Figiera and June Tryon, both residents of Springside at Seneca Hill, enjoyed corresponding with students in Moxley’s classroom, they were invited to help with the class St. Patrick’s Day meal preparation. Both pen pals led their groups with direction and focus and were ecstatic for the added company and conversation. With the help of a couple classroom parents, the students were able to prepare the following dishes for their feast: pratie oaten, pistachio bundt cake, corned beef and cabbage, Irish soda bread, potato soup and a mixture of mashed potatoes and green onion. One day after the preparation, students were able to enjoy the meal together. Several students also shared historical information about each dish and some Irish customs. The lunch and learn session taught Moxley’s students about the Irish potato famine, when the need for food exceeded the ability of farmers, how pork and lamb were more affordable meats and how corned beef and cabbage hadn’t truly dominated the Irish table, among other facts. Each group also shared how they prepared their portion of the meal and then expressed what they liked or didn’t like after tasting each dish. Moxley said the correspondence with community members will continue, as it had provided her students community connections, an exposure to the difference in generations, friendly letter writing and typic practice for the upcoming state English language arts test. The class will also prepare for an upcoming unit on studying their own culture, so they can better understand where they came from.